In my last post I spent some time (and many words) describing the what, how, and why behind some of the changes Apple has made to the Facetime protocol over the past three years. The IETF is currently working on port multiplexing (mainly via WebRTC) but I have yet to see a proposal that includes multiplexing signaling and media on the same port (with the architecture of WebRTC that's not a surprise). Either way I'll consider this "in progress". I guess there's always IAX ;). Compact SIP headers are already supported by a variety of open source applications. We'll consider this one done. SDP minimization is something that can't generally be done in a standards compliant way. You'll note I labelled these optimizations as a "slight protocol violation" in my previous post. We'll table this one for now. SDP compression, however, is very interesting. SIP bares more than a resemblance to HTTP and HTTP compression has been standard and well supported for quite some time. With that in mind I see no reason why it can't become more widely supported for SIP applications as well. It's also important to point out that while I'm calling this "SDP compression" it's really SIP body compression that could be used for any MIME type or combinations of MIME type (multipart). Fortunately I have good news! Shortly after my last post Daniel-Constantin Mierla from Kamailio contacted me and let me know that he had written the gzcompress module for "the fun of a quick coding in the evening". There's still work to be done on this module but this was an awesome (and unexpected) start! This is another marvel of open source - within 24 hours of my last post the leaders of two open source projects from across the globe were able to collaborate with me to support the functionality I described here. Amazing. Of course we're not done yet. I created a bounty for FreeSWITCH to support this functionality as well. Anthony and the boys are very busy but we'll see if I can get any traction on this one. That leaves PJSIP and HOMER. Seeing as HOMER is based on Kamailio it's probably not that difficult to implement this. I'd also like to think (based on the use case and project goals) that they may be more interested in this than anyone. A colleague of mine recently sent over a PCAP file containing an Apple Facetime session between two iPhone devices running just-released iOS 7. Being a protocol junkie he thought I might be interested in seeing them. Clearly that’s the case! As always (because I’m lazy) I looked around the internet to see what other research people had done on the “Facetime protocol”. I found several excellent (though now somewhat dated) articles. Without giving it away just yet it looks like Apple has been very busy over the last three years (like you needed me to tell you that). As we usually do here, let’s start looking at packets! Then some interesting details begin to emerge… What are these unknown packets? What’s up with this INVITE? That worked and we can see this is RTP using a dynamic payload type. 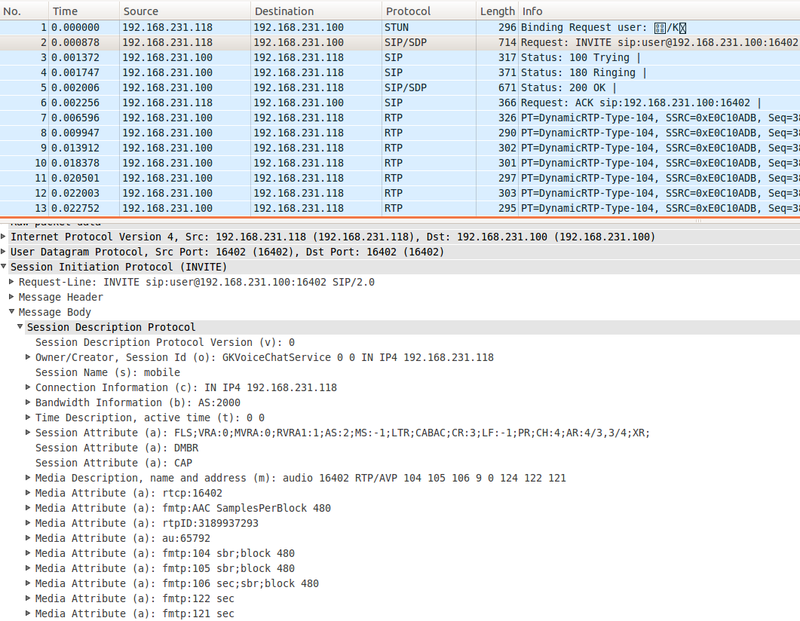 Our RTP packets are now correctly dissected but Wireshark seems to have confused the SIP and STUN packets for RTP. Why? Forcing Wireshark to decode a given stream (where “stream” is a SRC IP:PORT pair and a DST IP:PORT pair) attempts to force a decode of that protocol type on all packets belonging to that stream. So what happened here? If we look closer at the UDP layer we can see that STUN, SIP, and RTP all appear to be using the same port number on each endpoint (16402 in this case). We also have no idea what codec payload type 104 is (we’d need to see the SDP for that). Now’s probably a good time to look at the SIP signaling a bit closer. Apple is using compact SIP headers (interesting). The User-Agent uses the codename for Facetime and GK more than likely implies the use of Apple’s GameKit. That SDP, however, looks a little strange. Certainly not the simple, printable ASCII we’re used to seeing in SIP bodies! Now we can begin to analyze what’s actually happening here. Our INVITE contains a perfectly valid audio offer advertising support for PCMU (payload type 0), 16kHz G722 (payload 9), and six dynamic payload types. The IANA has defined static payload types for RTP. Simply put, we know payload type 0 is PCMU but anything between 96-127 SHOULD (RFC 4566) have a corresponding rtpmap line to map RTP payload type to a “media encoding name”. 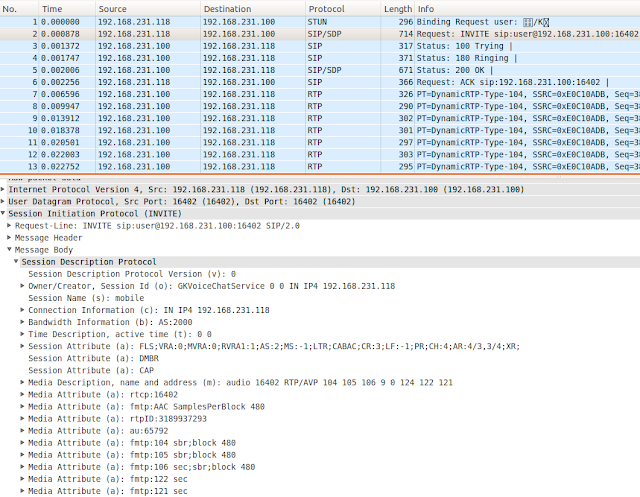 Looking at this trace alone I don’t know what these RTP payload types are. However, it’s very likely that the payload types have stayed the same even though Apple has now removed the suggested rtpmap lines. More than likely Apple has “hardcoded” these payload type codec maps internally. We’ll get to why in just a bit. Using what we know from the 2010 analysis (complete with rtpmap lines) it seems we have agreed to use the AAC_ELD codec at 24kHz and 16kHz sample rates. However, absent analysis of an RTP stream with payloads 121 or 122 (and missing rtpmap lines) it’s hard for me to say what those other payload types represent. A casual reader may have read this far and thought to themselves: at the end of the day we’re ending up with 24kHz AAC_ELD audio just like we were in 2010. Apple has gone through all of this work for nothing. Oh and by the way, how/why are SIP, STUN, RTP, and RTCP using the same UDP port? What’s wrong with three ports? Three ports make it much more difficult (if not impossible) to cross some types of NAT devices and firewalls. Three ports and three possibly bad interactions with some firewall or other device. Three times as much exposure to Murphy's law. With port multiplexing Apple has greatly increased the chances that Facetime will work through challenging network environments. With this aggressive (I’ve never seen it before) use of UDP multiplexing for all of these standard protocols Apple has virtually guaranteed that if the signalling works the media and everything else will too. UPDATE: The always on-point Olle Johansson has postulated that Apple might be multiplexing everything over a single port for greater compatibility with carrier grade NAT (CGN) implementations, which place specific limits on the number of ports used per client. Thanks Olle! Any SIP engineer will tell you NAT is the bane of our existence. That’s why (even from 2010) Apple has made use of protocols and features such as STUN, ICE, TURN, etc. These are discussed all over the internet so I won’t get into them here but in summary they are all technologies used to traverse NAT devices and network firewalls. It is very clear Apple has made Facetime (finally) ready for primetime. Let me explain why and how I came to that conclusion. First let’s talk strategy. Without going into all of the details it is my opinion that Skype became as popular as it is because (like many successes) “it just works”. The main reason Skype “just works” is its almost-magical NAT traversal. The creators of Skype learned a lot from their previous gig defeating firewalls for peer to peer music sharing with Kazaa. Both Skype and Kazaa have an almost legendary reputation for NAT and firewall traversal. If there is a way through a NAT device or firewall they will probably figure it out. It’s with this technology (and timing, codecs, etc) that Skype became so popular. When nothing else worked, Skype would (and still does). It just works (and as we’ve seen that’s hugely valuable). The more endpoints that “just work” the more Metcalfe’s law comes into effect. If Apple can succeed in making as many endpoints as possible “just work” they have a hugely valuable real-time communications network with Facetime. This clearly isn’t an off the shelf SIP and RTP based solution anymore, but how does it all add up? Also, why are three of these efforts focused on minimizing packet size (even if it means violating standards)? I know this has been a long and winding road. Hopefully you’re still with me! To understand the value of minimizing packet size you need to peek into another little-known area of the internet: IP fragments. I’m going to butcher a lot of this but at this point you just need to get the broad strokes. With these two technologies who cares about packet size? Firewalls and NAT devices, that’s who. First, many firewall administrators or vendors carelessly block all ICMP packets. That means PMTU is out. If Apple Facetime had greater than end-to-end MTU sized packets and depended on functioning PMTU there would be many instances where it would not work. IP fragmentation poses another problem. Once again, many network vendors and firewall administrators outright block IP fragments. To add insult to injury (or is that injury to insult?) many of these devices have broken and/or buggy support for IP fragment reassembly. This especially goes for UDP (which to be fair is not a “connection oriented” protocol). I have personally witnessed many instances where firewall devices could successfully reassemble IP+TCP fragments but not IP+UDP fragments. This leads to an almost unwinnable situation. Apple could use TCP for the signalling and UDP for media but then they’d lose the benefits of single port multiplexing. They could use TCP over a single port for everything but that would just be crazy. In either case TCP has a larger header anyway (larger header = larger packet for the same amount of data). fail% = % of vantage points where 5 packets where sent, 0 where received. From these results we can see that you start to have more than 1% failure when packet size is greater than 700 1000 bytes. The Facetime 2010 INVITE packet was 1093 bytes. The Facetime 2013 INVITE packet is 714 bytes. In any case there is a greater chance that the 714 byte packet will reach its intended destination. From these results we can also see that you start to run into real trouble once you reach 1400 bytes. Sure that’s twice the size of our current packet but who knows what the future holds for the capabilities of Facetime? Screen sharing, multi-party conferencing, file transfer, etc all depend on larger SDP descriptions. With the changes Apple has made they’ve not only increased the robustness of Facetime today, they’ve given themselves “room to grow” in the future. Apple has spent some time in the trenches over the last few years and found out how difficult real-time communications can be in the real world. Facetime isn't playing around anymore and Apple is becoming a serious networking (services?) company that's posed to take on current best-of-breed solutions. If you're interested to see how this might be implemented in various open source projects, check out the update!